The recipe below first appeared in A Baker’s Field Guide to Christmas Cookies. Enjoy! They are perfect when you need a simple cookie for decorating – winter Holidays or any time of year. Description: Here is a basic recipe for buttery, crisp sugar cookies. While it is simple, it is equally tasty. This variation uses colored sugars to decorate the tops. Historic Notes: This is often the first rolled cookie taught to American children. Recipes from the early 1800’s are very similar in that none of them use baking powder, which didn’t come into use till decades later. Also, the lack of leavener helps keep the cookies nice and flat, which yields a nice surface for whatever kind of decoration you like. Whisk flour and salt together in a small bowl to aerate; set aside. Place butter in bowl of mixer and beat with flat paddle on medium-high speed until creamy, about 2 minutes. Add sugar gradually and continue beating until light and fluffy, about 3 minutes, scraping down the bowl once or twice; beat in vanilla extract. Add eggs one at a time, beating well after each addition, again scraping down the bowl once or twice. Turn machine off, add about one-third of the flour, then turn machine onto low-speed. Gradually add remaining flour, mixing just until blended, scraping down bowl once or twice. Form into two very flat discs, wrap in plastic wrap and refrigerate at least 2 hours or until firm enough to roll. Dough may be refrigerated overnight. (You may freeze dough up to 1 month; defrost in refrigerator overnight before proceeding). Preheat oven to 350 degrees. Line two cookie sheet pans with parchment paper. Remove one disc from refrigerator and roll out to 1/4-inch thickness on floured surface; you may need to flour your rolling pin too. Cut out cookies with shapes of choice. Transfer cookies to prepared pans placing 2-inches apart. Decorate with colored sugars or regular sugar either in decorative patterns or free-form using photograph for inspiration. Bake for about 10 minutes or until edges have just begun to turn light golden brown. Slide parchment onto racks to cool cookies completely. 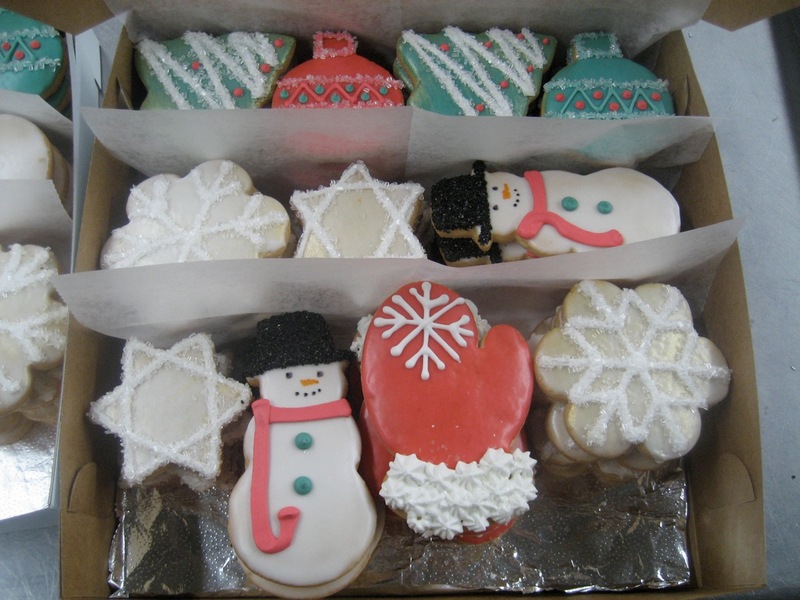 (Cookies may be stored at room temperature in an airtight container for up to 1 month). Good Cookie Tip: Last Christmas I made these cookies and they were as delicious as they were easy to roll out; the dough performed wonderfully. Then, for this book, I was re-testing the recipe in July in 98-degree weather with 98 percent humidity and it was a whole different ballgame. They worked, but only after I kneaded in some extra flour before rolling out. So, my caveat is to use your sense of touch. If the dough feels too soft and sticky, just add a bit more flour and you will have success.